As Bitcoin’s source code is openly available, it means developers easily build on it to create their own alternative cryptocurrencies or ‘altcoins’. Many popular cryptocurrencies can be traced back to a major cryptocurrency before. For instance, the cryptocurrency Dogecoin, was a variant of Litecoin, which was a variant of Bitcoin. If we analyze the very first altcoins we can see that there were only small changes made to Bitcoin’s original source code. Altcoins tended to differentiate in a few aspects. Firstly, the amount of coins that could be produced, the speed at which transactions were processed and the reward given to those facilitating transactions. Below is a summary of the first altcoins to be produced. Most are directly linked, with little in the way of major differences. There are now thousands of cryptocurrencies listed on websites like coinmarketcap.com. What has caused this explosion? For one as the cryptocurrency ecosphere is dedicated to open source development competent developers now have a host of other cryptocurrencies to build on. Secondly, cryptocurrencies like Ethereum make it relatively easy to create applications and altcoin on top of its blockchain. As of March (28th) 2018 there are currently 1591 total cryptocurrencies listed on www.coinmarketcap.com website. Here is the market capitalization at March 28th 2018 16:00. Bitcoin cash and Litecoin function in the same way as Bitcoin except their adoption rates differ. Litecoin was designed so that transactions could be processed quicker and has a different supply limited to Bitcoin as covered earlier. 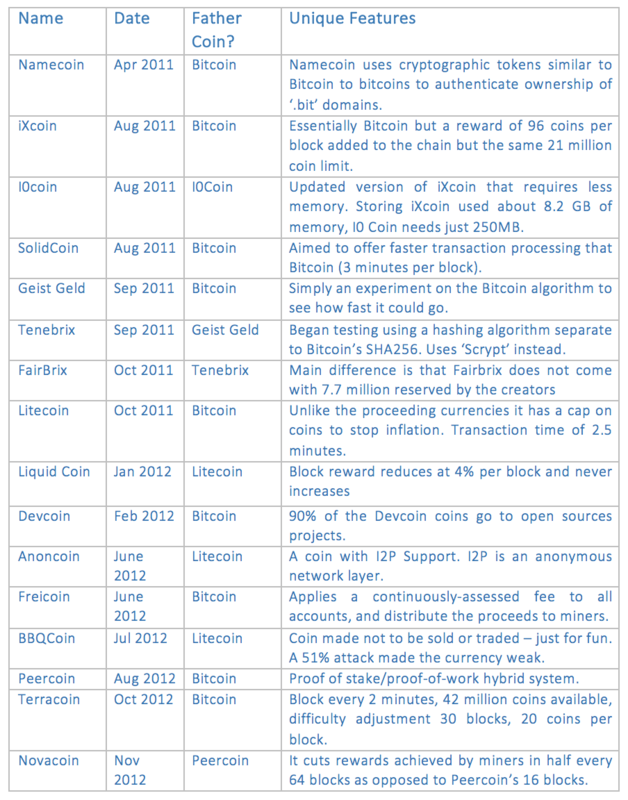 Bitcoin Cash is essentially Bitcoin but with eight times the scalability. It was a hard fork of Bitcoin where one camp decided to create an entirely new cryptocurrency because of how to deal with the scalability issues (current protocol cannot cope with the amount of transactions being processed). Two of these, Ripple and Stellar, differ from above in that they are designed as transaction networks. Most digital currencies are designed to be stored unit of value however Ripple and Stellar are created to digitalize regular fiat (national currency) transactions with their tokens. Both digital currencies offer faster payment solutions by utilizing blockchain technology. Ripple is suited towards banks and stellar for individuals trading foreign currencies. Both have central interference on what transactions are processed so it would be difficult to call them pure ‘cryptocurrencies’.